OTIF: Are You Prepared for the August Deadline? Have you checked your OTIF “Minimum Objective” in Retail Link? Suppliers will be held accountable for their On Time In Full (OTIF) performance in less than 8 weeks. 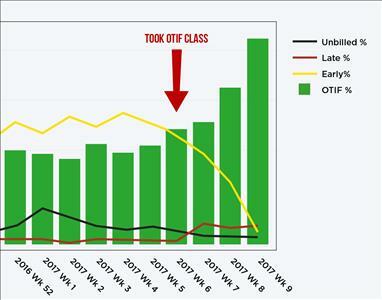 Time is running out to impact your OTIF results for August. There are some suppliers who are waiting to see what happens before they act. Colby Beland of CaseStack affirmed in a recent interview, “I still work with suppliers who don’t know what OTIF stands for.” If your company still doesn’t have a handle on OTIF, or has no concept of what’s about to hit in August, there is still a small window of time to make adjustments. Need Help with OTIF Now? Visit the OTIF Support page to schedule one-on-one time with an expert who will help evaluate your business, as well as create and implement an OTIF Action Plan. For suppliers in the Atlanta area, 8th & Walton is hosting a special OTIF and GRS Conference July 25 – July 26. When you’re trying to improve your OTIF score, a third-party consolidator can be a valuable resource. Colby Beland of CaseStack assists suppliers by showing how outsourcing consolidation and logistics saves time, money, and increases the OTIF score. Learn more by visiting the CaseStack website. This entry was posted in Ask the Expert, Podcast, Supplier tips and tagged Flow Initiative, Global Replenishment Solution, Global Replenishment System, GRS, mabd, on time in full, otif, Replenishment, Supply Chain, Walmart Flow Initiative. Bookmark the permalink. One Response to OTIF: Are You Prepared for the August Deadline?